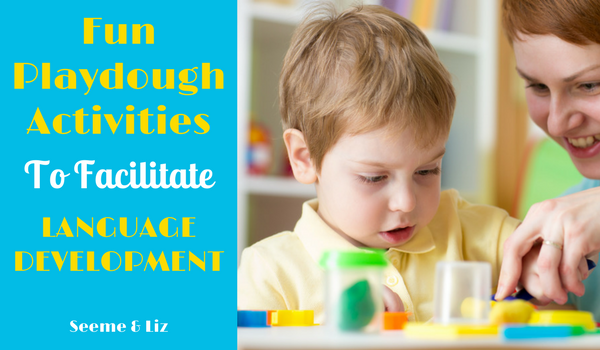 Seeme & Liz > Play Based Learning Articles (2-4 year olds) > Fun Playdough Activities That Are Great For Language Development! Playdough! So much fun for kids, yet so much mess for parents. I am starting to see a theme here. Fun activities for kids tend to be the activities parents find the messiest. My kids love playdough! They started really enjoying it around 18 months. My son may have been a bit younger because his older sister loved playing with playdough. 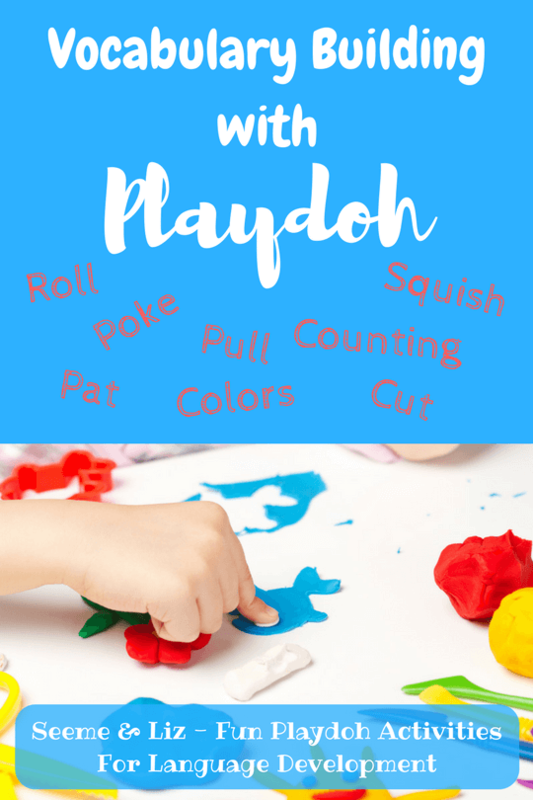 If you can get beyond the mess children can make with playdough, there are actually many fun playdough activities for you and your child. And many of these activities can encourage language development, imagination and fine motor skills! 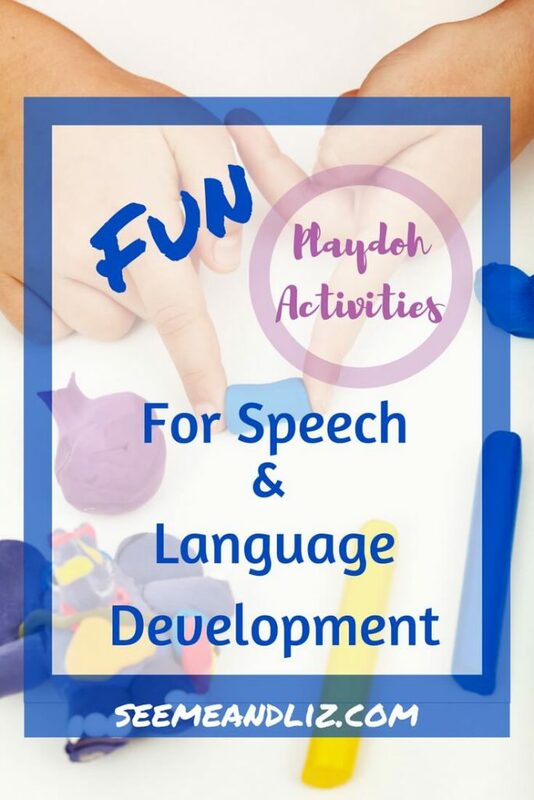 In this article I will share with you some fun playdough activities and how they can encourage language development among other skills. At What Age Can My Child Start Playing With Playdough? Unfortunately there really isn’t a “right” answer to this. It really depends on your child. If you are making your own playdough and you know the ingredients are safe if ingested, then I would say 8 months plus is fine. Are you wondering “how do you make playdough?” Check out this basic homemade playdough recipe. If you are using store bought playdough it is probably best to wait until the age of 3 (as per most manufacturers instructions). However, if an adult is supervising then they can make sure the child is not eating the playdough. Making playdough at home isn’t for everyone. Luckily you can find a lot of playdough online! And the prices are quite reasonable. This is a common question, and it really comes down to you, your child and your home. If your child is still in a high chair, this is probably the best and safest place. As children get older they can sit at the kitchen table table or stand on a chair, or even better, in the learning tower, at the counter. You could also put a plastic table cloth on the floor and have them sit there. However then they are free to constantly wander off with playdough in their hands. ♦ If you are making your own playdough, it tends to leave a “salty” dry layer on the hands. Your child may be sensitive to this (my son was) so make sure to have a damp cloth near by for him to wipe his hands. ♦ Your playdough may start drying out. If this happens, add a bit of water or a few drops of oil and kneed it thoroughly. This will greatly expand the lifespan of your playdough. You can do this with both store bought or homemade playdough. ♦ For children under the age of 2 I suggest staying away from scented or edible playdough. Even if you are making it yourself at home and know that all the ingredients can be safely ingested, it is not a good idea to encourage the eating of playdough. You never know when your child may be playing with commercial playdough and think this is safe to eat as well. Once you and your child have picked your favorite playdough – store bought or homemade, you can begin by manipulating and playing with it. Toddlers will get a thrill out of just touching playdough and experiencing the sensory aspects of it (unless your child has a sensory processing disorder). Follow your child’s lead to see what interests him most about the playdough and then copy his actions and/or words. Expand what she is saying/doing to keep the conversation going. Experiment with these “tools” to create some fun and simple shapes with playdough. Children over the age of three will most likely not be interested in just “playing” with playdough. They will want to engage in some fun playdough activities which will encourage them to use their imagination. Some children between the age of 2 and 3 will be ready for some more advanced play with playdough. Again, this will depend on the maturity of your child. Depending on the age of your child you can either engage in the play or simply help your child get out all of the playdough supplies and let him play independently. Allow your child to choose a variety of cookie cutters and different colors of playdough to make “cookies” with. Talk about the different “cookies” you are baking, for example “I am going to make a flower cookie” and then ask your child “what cookie will you make?”. Talk about the colors of playdough you are using. Discuss what the cookie will taste like. Ask your child what her favorite cookie flavor would be. You could then put the “cookies” onto a cookie sheet and pretend to bake them in the oven. Set up a “tea party” when the cookies are all done. This activity can last as long as you and your child would like it to last. Make zoo animals using some googly eyes, pompoms and of course, playdough. On the weekend, my son wanted to make a dinosaur exhibit, complete with an erupting volcano and dinosaur fossils. We spent at least an hour or more talking about dinosaurs and making volcanoes and fossils. He added plastic dinosaurs to his erupting volcano! If you are making a playdough zoo, be sure to include the habitat of the animal. For example, talk about where monkeys live and then make some trees for them to swing in. There is so much language that can happen during an activity like this. And its a great way for a child’s imagination to flourish! This is similar to the playdough bakery, but there are so many more options here. This is a favorite in my house. My children love playing “restaurant”. If there is no playdough around they will use plastic/wooden play food. However, doing this with playdough allows them to create whatever they want, and playdough allows for fine motor development as well. Since I am not an occupational therapist, I will not get into the specific was playdough can help build fine motor skills. Your child can be both the chef and the server in this activity. Talk about the types of things you might order at a restaurant that you can make with playdough. If your child is 6 or older, have him write out a menu of a few basic items that might be available at the restaurant. This activity can end up being hours of fun. There are literally endless things you can talk about. My son included an egg, sunny side up on his menu! These are just a few of many activities you can do with playdough. As you can see the opportunities to encourage language are endless. From talking about action words and nouns to asking and answering questions, there is no limit where you can go with playdough! What are some of your child’s favorite fun playdough activities? Please leave me a comment! Boy this brings back memories. I used to love playing with playdough. My son never got into it but my daughter did. Even though I played with it like you mentioned. Using words like cut, pat, and even colors it didn’t really hit me that playdough was a learning tool. Thank you for the fun and useful information. Thanks Melissa. Don’t worry, you are not alone. Most parents don’t see all of the learning that happens when a child is playing. This learning happens in both unstructured play as well as guided play. A child playing with playdough would most likely be experiencing both types of play. Entertaining article! My kids are fond of playdough and I usually set a perimeter using unused cloth and let them play sitting on the cloth. But as you mentioned they tend to get out of the perimeter, happily showing their elder sister their creation 🙂 I like your idea of using playdough to build up their vocabulary so that they can learn from playing. I will definitely try this with my 2 years old girl. It is also great that you provided different ideas on fun activities using playdough as this is great for some family bonding. Thanks a lot for this and I look forward to more of your fun articles! Thanks! I’m happy to hear you enjoyed reading some of my fun playdough suggestions to build a child’s vocabulary. And you are right, it is also a great way for parents to interact with their children. My kids love making “food” with playdough and then setting up a restaurant. They love to serve us their creations! Hi Tanya, this page brings back not only memories from my childhood but also from my daughter who is grown now and raising her kids. Playdough has been around for a long time, I can almost smell it from this page 🙂 A must for any child growing up and still fun for adults too. Thanks John! Playdough is one of those things that never goes out of style! And now there are even more kinds of playdough on the market than ever! Please share my site with your daughter if you think any of my tips could help her with her own children! Reading this brought back some happy memories – I used to love playdoh as a child. I vaguely remember my mum making her own on the stove for my little brother too at some point. You’ve given some great examples of how to get some role play going and get kids (and adults) to use their imagination. I might have to get some and surprise my nephew with a playdoh date soon! I am glad that this brought back memories for you Claire! Let me know how the playdough date with your nephew goes!